Can wage inequality be explained by increasing dispersion in firm productivity? Much of the growing wage inequality stems from increased inequality between firms rather than within firms, suggesting inequality is driven by changes in firm-level productivity related to new technology rather than to international trade or institutions. Trade protectionism or re-energising unions may do relatively little to reverse the increase in inequality. Wage inequality has increased substantially in the United States and the United Kingdom in the last thirty years. This fact, which is now solidly established, fuels debate on a wide range of policy measures ranging from taxation, corporate governance and labour market institutions all the way to trade, education, and safety-net policies. In some quarters, rising inequality is held up as evidence that pro-market reforms help the rich and powerful to exploit the average worker. In others, it is used as an argument for programmes to upgrade skills. The proper policy response, however, requires an understanding of what caused the inequality. As it turns out, a big part of this rise in inequality comes from increases in inequality among similar workers (what econometricians call “within-group” inequality). Many explanations for this are on offer – the leading candidates being globalisation, technology, and/or institutional reasons like declines in union membership or the minimum wage (see Goldin and Katz 2007 and Machin and Van Reenen, 2007). These theories share a common prediction. Since workers’ pay is linked to their productivity, wage inequality increases should be accompanied by increased productivity dispersion. That is, the productivity distribution for workers with similar age, gender, education and experience profiles should have widened. Unfortunately, no one seems to have properly tested this even though it has important policy implications. If the root source of increasing wage inequality is an increase in the productivity dispersion of workers with similar skill profiles, adding more skill to the labour force will do little to ‘cure’ the problem. The natural place to test the productivity-inequality link is in the firm-level data. In some recent research, we look at changes in firm productivity over time focusing on the difference between high-productivity firms and low-productivity firms amongst representative samples of hundreds of thousands of firms.1 We analyse both manufacturing and non-manufacturing sectors of the UK economy. This provides important value added. Earlier studies have focused on the manufacturing sector and we find that manufacturing and services have experienced very different trends.2 Moreover, our study begins an international comparison between the UK, France and Norway that needs to be thoroughly explored. Over the 1990s, we document a rise in productivity dispersion in France, Norway and the UK. The rise in France and Norway has been smaller than that in the UK. The comparison is interesting because when a general purpose technology, like information and communication technologies, becomes ubiquitous, it should impact firms worldwide; our cross country comparison allows us to sort out this sort of general effect from more UK-specific changes. It is well-known and entirely understandable that different firms have different productivity levels. A key finding in our work is that the productivity gap between firms has been widening. We look at two groups of firms: one at the top (90th level) and one at the bottom (10th level) of the productivity distribution. Between 1984 and 2001, the rate of growth in productivity has been 17% for firms at the top and only 8% for firms at the bottom. Productivity for firms in the middle has grown by 14%. Measuring productivity dispersion as the difference between the top (90th level) and the bottom (10th level) deciles, this 90-10 differential increased by 33% between 1984 and 2001 (see Figure 1). 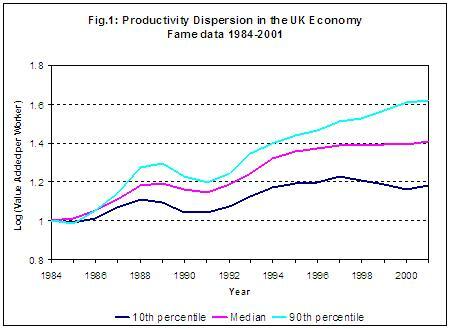 Note: This graph shows the increasing dispersion of labour productivity between different firms in the UK 1984-2001. All productivity is indexed to be one in 1984, so the lines show the growth in productivity at different parts of the distribution (i.e. the upper line is at the 90th percentile, the middle line is the median and the bottom line is at the 10th percentile). We also document that much of the increase in individual wage inequality in the UK occurred between firms within the same industry (between-firm component) instead of within firms (within-firm component). This is an important finding when looking for ‘culprits’ of wage inequality. It says that little of extra inequality has come from a change in the way firms treat their own workers. The main source is the change in firm-level productivity. This implies that understanding the evolution of productivity distribution between firms may be critical in understanding the evolution of wage distribution (we also show that the correlation between wages and productivity has become more important over time). The between-firm differences in productivity growth and wage growth is mainly in the service sector. This implies that existing studies, which focus on manufacturing (currently employing only 13% of the UK workforce), have underestimated the rise of productivity inequality. Finally, we show that changes in labour productivity are mainly driven by changes in total factor productivity (rather than changes in capital equipment and machinery or the quality of a worker-job match). These results suggest that technological differences between firms may be the underlying cause. Using data on information technology, we show that productivity dispersion rose most strongly in sectors where IT intensity grew most rapidly. In terms of policy, this suggests that the causes of rising inequality are primarily structural and related to new technology rather than to trade or institutions. Thus greater trade protectionism or the re-energising of unions may do relatively little to reverse the increase in inequality. A better strategy would be to concentrate on raising the skill and education levels of the workforce, particularly the skills of those at the bottom of the ability distribution. Dunne, T., Foster, L., Haltiwanger, J, and Troske, K.R. (2004), “Wage and Productivity Dispersion In US Manufacturing: The Role of Computer Investments,” Journal of Labor Economics, 22 (2), 397-429. Faggio, G., K. Salvanes and J. Van Reenen (2007). “The Evolution of Inequality in Productivity and Wages: Panel Data Evidence”, CEP Discussion Paper No 821, London School of Economics. Goldin, C. and L. Katz (2007) “ Long-Run Changes in the U.S. Wage Structure: Narrowing, Widening, Polarizing”. NBER WP 13568. 1 Faggio, Salvanes and Van Reenen (2007). 2 Previous studies have focused on manufacturing only (see, e.g., Dunne, Foster, Haltiwanger and Troske, 2004; Haskel and Martin, 2002). Professor at the Department of Economics, Norwegian School of Economics Director Center for Empirical Labor Economics (CELE), and depity-director of FAIR, Center of Excellense.